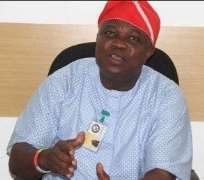 A web of intrigues surfaced on Monday as Lagos State Governor, Mr. Akinwunmi Ambode, and two others, Mr. Jide Sanwonolu and Dr. Obafemi Hamzat, picked the governorship nomination forms for the All Progressives Congress (APC) ticket for the 2019 contest in the state. The three of them are known godsons of the party's national leader, Senator Bola Tinubu, who, it has been variously speculated, has unresolved issues with Ambode. The initial information THISDAY had yesterday was that Ambode proceeded to Abuja to pick up his forms after getting signals from Tinubu that the coast was clear for him to make his move for a second term of office. But by last night, sources said, the tide had changed in an intricate political maneuver that threatens to leave the incumbent governor high and dry. With the entrance of Sanwonolu and Hamzat into the race, a storm, THISDAY gathered, is about to hit the Lagos political firmament, and Tinubu might find himself in a complicated dilemma. According to a THISDAY source, the governor's main opponent is being backed by the Mandate Group, his godfather's associates, who felt slighted by his policies that had gravely injured their economic lifelines. THISDAY gathered that leading members of the group mobilised all the party's local government chairmen last night to Watercress Hotel, Ikeja, believed to be owned by a former chief security officer to Tinubu, Mr. Tayo Ayinde, to fill Sanwonolu's nomination forms, which submission closes tomorrow. The governor's political future had been in abeyance as a result of speculated disagreements between him and his godfather, necessitating high-level interventions by senior party stalwarts, including Vice President Yemi Osinbajo. But with the Mandate Group now massed behind Sanwonolu, it is most unlikely, said an authoritative source, that Tinubu would dare his political base to chest out for Ambode.